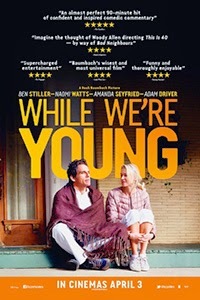 Last year, American indie director Noah Baumbach wowed audiences with his kooky monochrome comedy Frances Ha (2012), now he is back with While We’re Young (2014). Baumbach’s latest may be another hipster comedy playing with the tropes of arrested-development yarns, but it feels incredibly fresh and has one of the smartest scripts you will see delivered this year. It’s also arguably Baumbach’s most mainstream movie to date. Ben Stiller, who previously collaborated with the director on Greenberg (2010), stars as Josh, a frustrated documentarian while Naomi Watts plays his wife Cornelia, whose father (Charles Grodin) happens to be a celebrated documentary filmmaker. Josh and Cornelia are childless, and clearly resisting the expectations of their age, while their friends relish the joys of a pram-pushing life. In a seemingly chance encounter, Josh and Cornelia meet Jamie (Adam Driver) and his girlfriend Darby (Amanda Seyfried), who live the epitome of the hipster life in Harlem. Jamie’s warehouse conversion home is decked out with typewriters, records and VHS players – they make a living selling organic ice-cream and are, well, just frustratingly trendy. Jamie is an aspiring documentary filmmaker and pitches an idea to Josh, who is more than a little flattered by the attention, which happily distracts him from his editing woes of a long-gestating project. Baumbach’s skill with While We’re Young is how he handles the clash of the age groups. The young couple is wrapped in the nostalgia of a bygone analogue age, resisting the digital world that Josh and Cornelia are hoping to engage with full force in a lame duck attempt to stay young. It is easy to imagine audiences falling into two camps as to which couple they prefer depending on their age group. However, Baumbach isn’t concerned with the merits and faults of either camp, only the process of growing old and generational wars as one undercuts the other. As the friendship progresses, the full force of the film’s comedy is unleashed. The ferocious energy of Jamie and Darby is too much for the unfit older couple. Watt’s Cornelia desperately tries to keep up with Darby at her hip-hop dance exercise class, while Stiller’s Josh looks pain-faced cycling around New York, only to be later diagnosed with arthritis by his doctor as a crushing reminder of his age. The casting of Stiller is a little shocking after the diet of his recent performances we have been fed, namely his increasingly tiresome Night At The Museum films. In While We’re Young it could have been no one else but Stiller, who expresses the exasperation of his character with aplomb. Time wears on, and as can be expected cracks begin to appear in the couples’ friendship, made worse by the increasing sense that Jamie is playing Josh to get closer to his celebrated father-in-law. While the film acts as a balm, or perhaps even therapy, to the woes of growing older, it is a smart reminder that the heady delights of youth won’t last forever, parcelled in gleefully neurotic humour reminiscent of Woody Allen’s best work, with the occasional bursts of humours anger of Larry David. Perhaps the greatest achievement of Baumbach’s film is in exposing the sham of it all. The current generations apparent moral ambivalence, and the older generations incredulity at a world that seems to be shifting all too quickly and their pleading attempts to catch up. It is a rich, smart, and tart comedy that treats its subject matter with weight delivered with the lightest of touches. Incredibly, Baumbach has followed up Frances Ha with yet another hit.